Sold in Limited Quantity Batches in the NC Mall from January 24th, 2013 - ? Grants you 5 days of reduced training time (30%-75% faster) at all three Neopian training schools (even that secret one). Like other fortune cookies, the Training Fortune Cookie(s) you have bought will be placed into your inventory. Click on the fortune cookie in your inventory to use it. Remember the Training Fortune Cookie can only be used on your MAIN account. Once used, the Training Fortune Cookie will make your training time be anywhere from 30-75% faster for 5 days starting at the time you use the cookie.. All basic training rules still apply. You will be able to see how much the cookie cut your training time by once you enroll and pay for your training course and the time left shows up. More information about this cookie coming soon :)! You can read the FAQ from Neo (below) for some basic information til then. In the section below you can see all the questions and answers specifically about the Training Fortune Cookie from the Neopets Help Page. By how much will my training time be decreased when I use the cookie? Each time you enroll your Neopet in a training course while the cookie is active, that course's training time will be decreased by at least 30%. However, there is a chance that it could be discounted up to 75%! You won't know exactly how much the discount is until you pay for the course and your Neopet actually enters training. Can I open and use the Training Fortune Cookie on my side account(s)? No. Please keep the use of this cookie to your main account only. 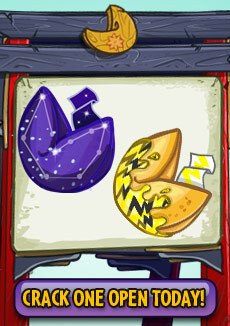 How many Neopets can I train with the Training Fortune Cookie? You may normally train all your Neopets at once, though each can only be enrolled at one training school at a time. The same rules apply while a Training Fortune Cookie is active. How will I know my training time has been decreased? There are two ways! First, once you have activated a cookie and paid for your course, a small overlay will appear telling you the percentage time reduction you received off that course. Secondly, the status page will display the original training time, which will be crossed out, and the discounted time remaining will be added. How will I know when my Training Fortune Cookie expires? What is the Training Fortune Cookie? The Training Fortune Cookie, once opened, grants 5 days of reduced training time at all three Neopian training schools (even that secret one). While the cookie is active, any Neopet you enroll in a course will not have to spend as long in the school before their training is complete. Note that the cookie does not affect training cost! You still owe the training school masters the appropriate codestone/dubloon fee in order to train. We suggestion having these items ready in your inventory before you use the cookie to make the most of your discounted time! Secret Ninja Training School: It's a secret! Why did I receive an error message while attempting to open a Training Fortune Cookie? This is probably because you already have an active Training Fortune Cookie. Visit a training school and check the banner to see how long you have left. Only when that cookie's time expires can you open another. Will I be able to gift the Training Fortune Cookie? Sure! The Training Fortune Cookie functions like any other NC item and can be gifted with a NC Gift Box (one item per NC Gift Box). As with all NC items, this cookie can't be sold or traded. Will I be able to open multiple Training Fortune Cookies at once to cut down training time even further? Nice try, but no. ;) You will only be able to open one Training Fortune Cookie at a time. Please wait until the current cookie expires before opening another cookie.